There are few directors who, when faced with a lack of opportunities in their mid twenties, would start their own theatre from scratch. Jay Miller, however, is one of them. 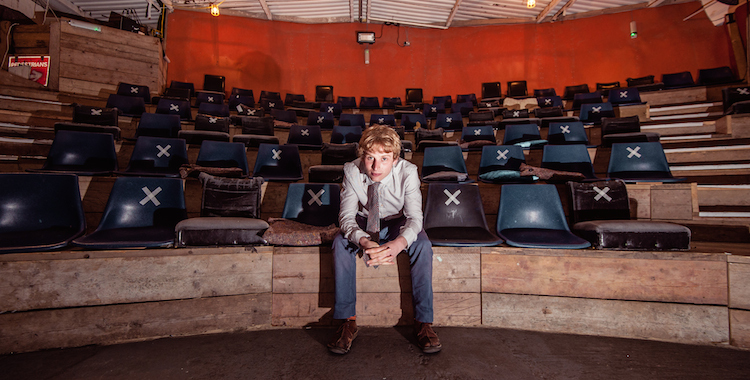 In 2011, in the midst of recession, the young director founded a theatre in a draughty warehouse in Hackney Wick. The Yard, built on a shoestring and constructed from reclaimed and recycled materials, was something of a conjuring act: bold, improbable and summoned almost from thin air. Miller identifies three impulses behind the founding of The Yard: boredom, frustration and anger. “The boredom was with the theatre that I was seeing. The frustration was with an industry and a world that felt quite closed. And an anger because it was the time of the economic crash and I just felt angry that I’d been sold a dream by Tony Blair and graduated and entered into a world that felt like it was a trap.” When combined, this cocktail of emotions generated a determination to “just do something”. Instead, the aim of The Yard was to nurture new work and to focus on the role of space in audience experience. No black box here. Building on a personal interest in architecture and roping in a few friends, Miller designed a theatre that was part warehouse, part Greek amphitheatre. He explains that the desire was to marry something of the booming immersive theatre scene with a self-consciously theatrical design. “We wanted a space which felt like an experience, which felt inclusive and which felt very live. But we also wanted to in some way acknowledge that it was theatre.” Miller adds that “the friction between that design and its context goes some way to releasing this energy that I was seeking to find in a space”. The Yard started out, Miller admits, with “a worrying lack of planning” and no real business model. “The biggest punt that I ever took in the moment when I thought ‘let’s make this happen’ was gambling that other people would be feeling similar things to what I was feeling, that people would be thinking similar things to what I was thinking,” he recalls. Since then, both the space and the theatre it presents have evolved, scooping two Empty Space Awards and an Off West End Award in the process. “The programme at The Yard is organic,” says Miller, explaining that each new season has developed out of the previous one. Shows that have been presented as works in progress often return for longer runs, while themes emerge and reappear. The latest development is a shift towards a mixed programme of four to five week runs interspersed with seasons such as this year’s NOW 14, which offer an opportunity for artists to show work in shorter bursts. The current autumn season, for instance, consists of two four week runs for These are your lives and The Hundred We Are, while submissions are for next year’s NOW 15 are opening later in the month. Miller confesses, however, that the support The Yard is able to offer artists is restricted by the limited resources that they have to work with. While he insists on the importance of paying artists whenever possible, he adds that “we don’t have huge wads of cash to give out”. Instead, the theatre supports artists in a range of different ways, which often includes taking on a producing role. The ultimate goal for Miller is “to achieve a real balance between opening our doors, developing and investing our resources in artists, and then putting on what we think is the best work in the UK”. It’s an ambitious set of aims, but one that Miller is confident of the need and desire for among the London theatre community.